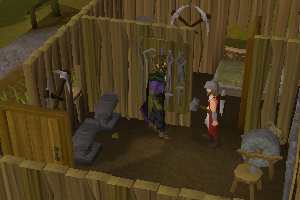 To start this quest, first speak to Doric, the friendly Dwarf located in a small house North of Falador. Ask him if you can use his anvils, and he says that he will let you use them if you get some things for him. He needs 6 Clay, 4 Copper ores and 2 Iron ores. 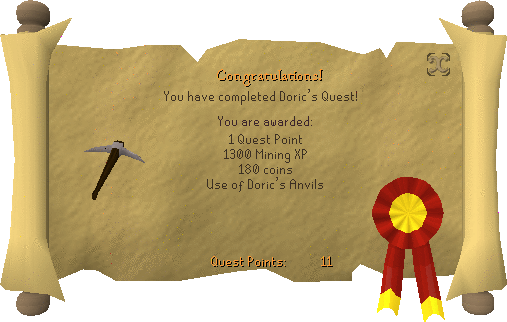 To assist you in this task, Doric gives you a Bronze Pickaxe with which to mine. It doesn't matter how you obtain the ores, and they can be either mined, traded from other players, purchased from a shop that sells ore, or bought from the Grand Exchange. 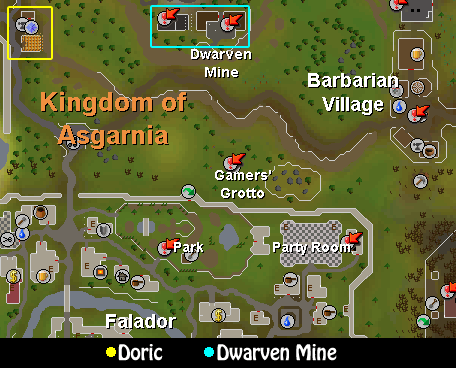 Each of the required materials that Doric needs can be mined from the Dwarven Mine, located a short distance east of Doric. They may also be mined from the Rimmington Mine. A list of mines can be found in our Mining Maps section. There is a shop run by Drogo Dwarf in the Dwarven mines which sells both Copper ind Iron. It is located to the east when you first enter the mines, and you can buy Iron for around 1gp each. The shop will also sell copper in small amounts, so it's best to mine the ores yourself. Once you've got all of the needed ores, just head back to Doric, give him the ores and you're finished the quest. [^] Ask Doric if you could use his anvils. [^] Mine 6 Clay, 4 Copper, and 2 Iron Ores.